These pots are for slow cooking but what is in them? And the real mystery: the food seems cooked but why is the fresh rosemary sprinkled on the top? French, lives on the Island of Crete. Food is an essential part of culture and its cuisine is what makes it distinct. The daily life and the economic structure of society are the factors that shape it. Cuisine is a reflection of culture. For example, how someone prepares vegetables and fruits to make a meal is a signature of their homeland. 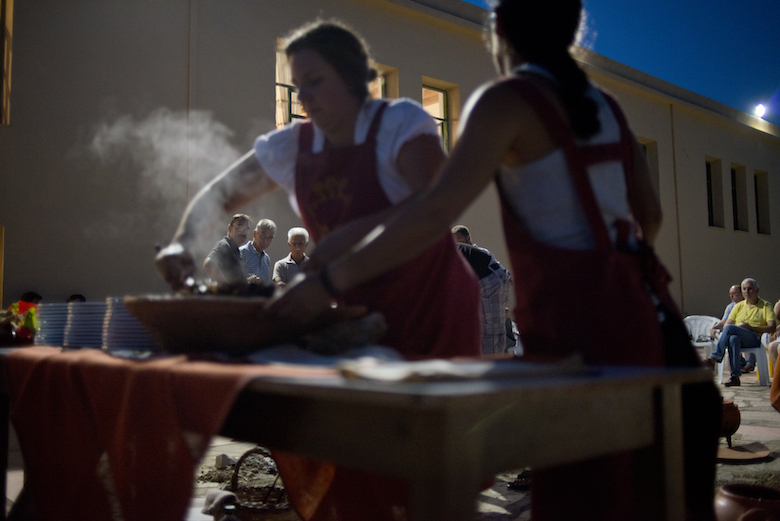 Beyond cooking, food provides a venue for people to gather and share. 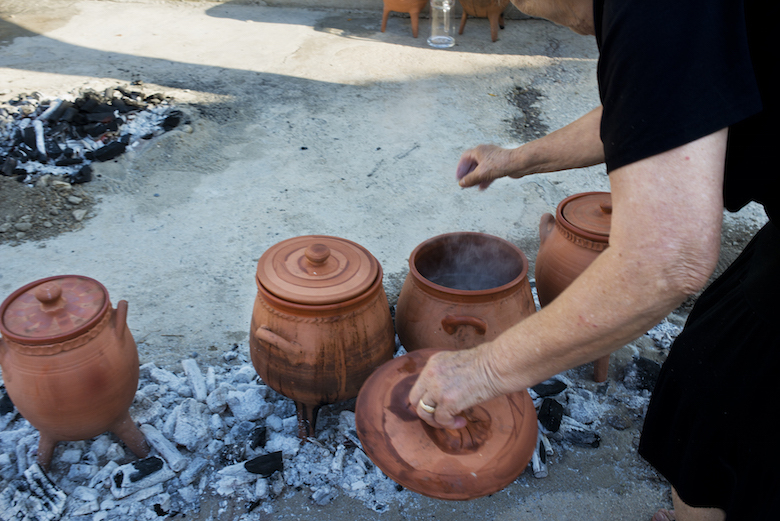 When it comes to Cretan cuisine, the traditions that people use to prepare and cook food, as well as the tools and the techniques used show us that cuisine in Crete has it’s own identity. Turkish, lives, cooks, and creates in Istanbul, Turkey. Smells of honey, vinegar, lentils, lamb, almond, fennel, rosemary, and oregano escape each pot as its individual ingredients simmer. These aromas mingle deliciously with the smell of barley crunchy cakes that are perfumed with thyme. They swell as the roast over the coals. 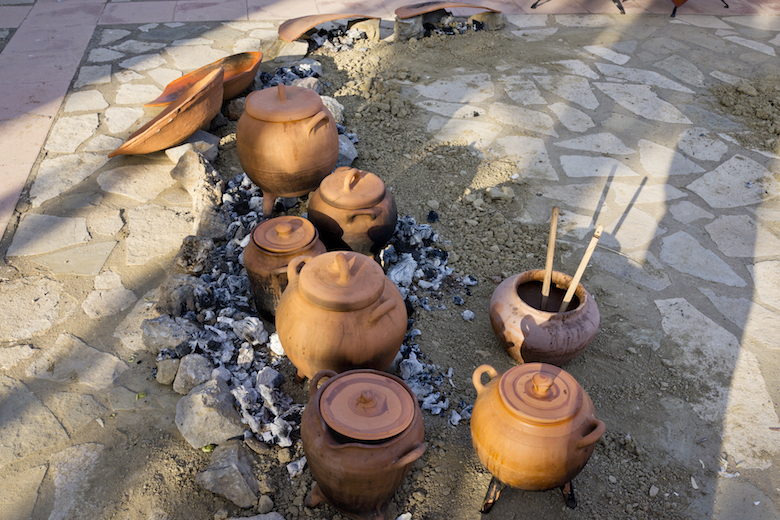 The use of fire and cooking on it, either directly or in pots, has always been a field of research that has interested historians, scientists, and even famous chefs. But what no research will ever unveil is the ingenuity and the need of a mother to find ways through food to offer all her love and affection to her family. It remains complicated and almost impossible to compare the memory we have from "mother's food" to even the the most expensive, rare, and perfectly executed dish we can enjoy. - Stelios Fanourakis, Chef de Cuisine. Greek, lives and works in Rethymno, Crete. Octopus is a Cretan delicacy in coastal and rural towns. It is a valuable protein source. Since it is bloodless, the Orthodox Church allows it to be consumption during Lenten seasons—Christmas, Easter, August 1-14. When I look at this image the memories and emotions that come first are not linked to seaside summers. Instead, the warmth of the parastia (charcoal heat) and the smell of burning wood, together with the boiling sound of octopus and seeing the olive oil jar reminds me of Easter. The anticipation, sound, and smell create a fulfilling meal after a hectic day. This anticipation is what we feel knowing that the Easter feast is close. This combination results in a meal that offers a promise that something spectacular will happen. Greek, from the Island of Crete. 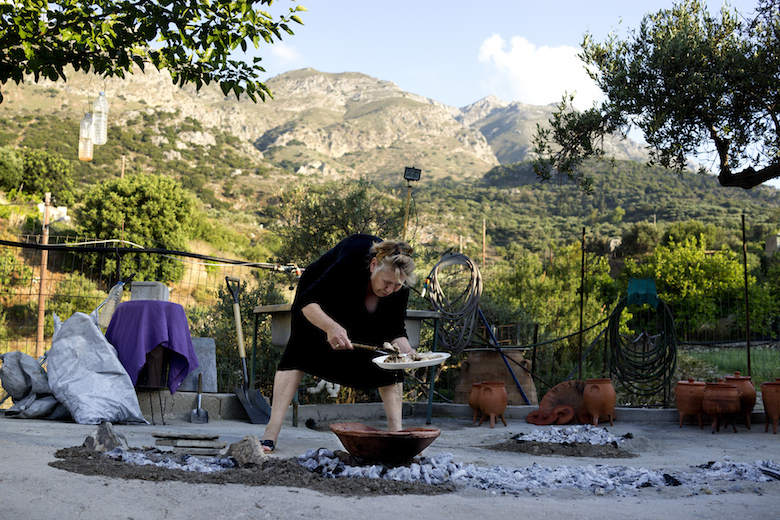 The Cretan mountains are backdrop to outdoor cooking at its best. 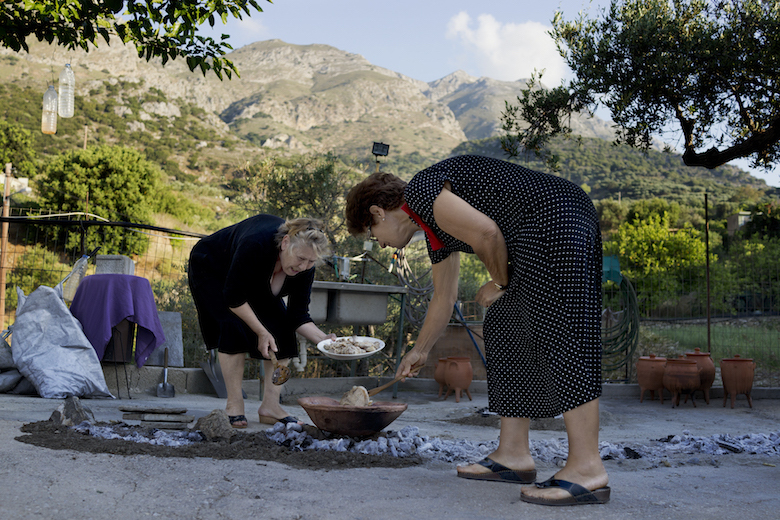 In this timeless scene, cooks companionably chat and test the readiness of their meal — pork, slow-cooked in a Minoan-style lekani over a bed of coals. 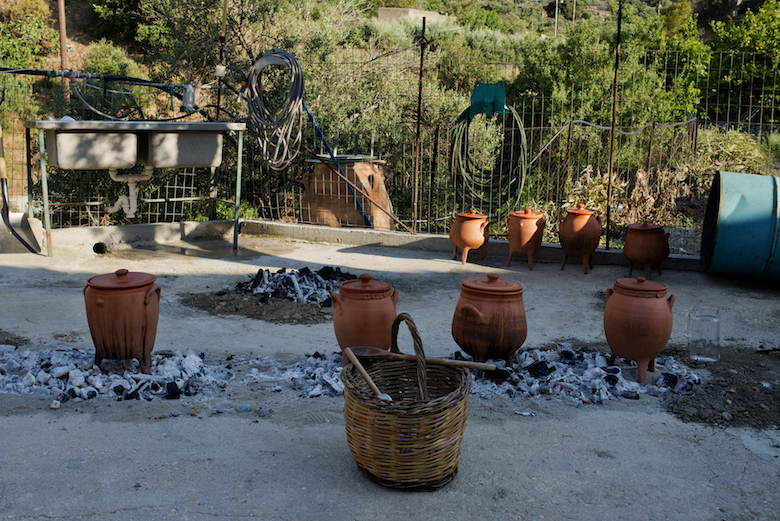 Along the fence, Minoan-style tripod cookpots, stained with dripped food and smudged from smoke, await their next event. Plastic water-bottles weigh down the branches of a mulberry tree, slowly training them into a cool, green, leafy canopy to shade the cooking area. An olive tree provides shade, food and fodder. The outdoor sink with water brought in by a black irrigation hose completes the picture. American, works and lives on the Island of Crete...much of the time. 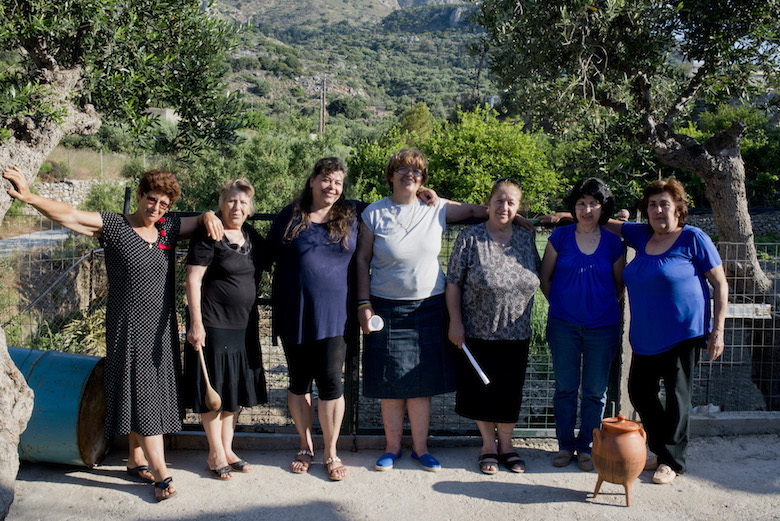 The ladies of Kavousi are used to cooking... they’ve been cooking since they can remember. But today was different. 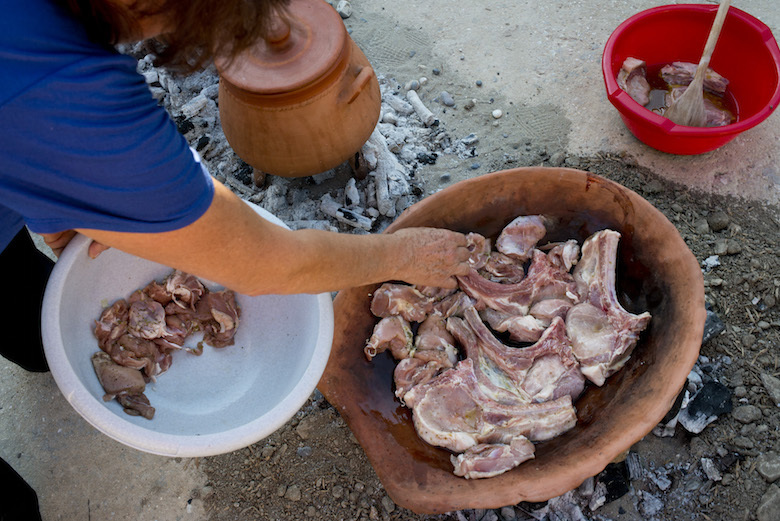 Today they cooked as their Minoan ancestors cooked 3000 years ago. 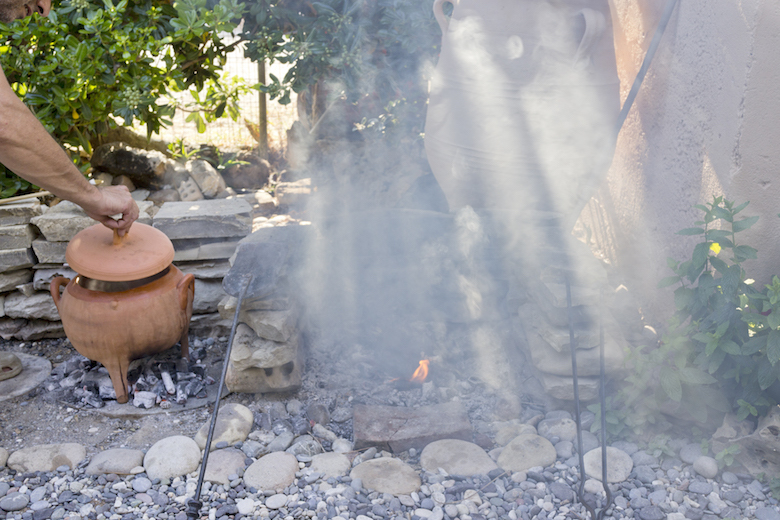 Same ingredients, all found on the island... same slow cooking method, for the Minoans were the founders of slow cooking, but this time, outside on an open fire using a single pot – a clay replica of an ancient Minoan cooking pot. This link with their past is their heritage for it’s the foundations of the Mediterranean Diet – the world’s healthiest diet, which hales from their tiny island of Crete. Australian, lived and raised family on the Island of Crete. Pottery is an ancient craft that connects us to our past through cooking. --Nafsika Antypas, food activist, producer & creator of TV series Plant Based by Nafsika. Canadian-Greek, works and lives in North America with ties to Greece. 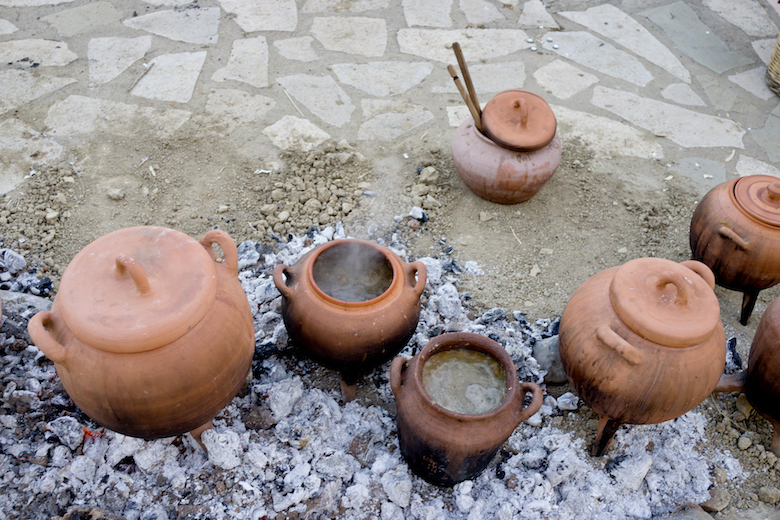 What culinary delights are bubbling inside these fascinating Minoan-style cooking pots? Octopus, goat, wild greens, and lentils stewed in a rich broth of exotic spices. 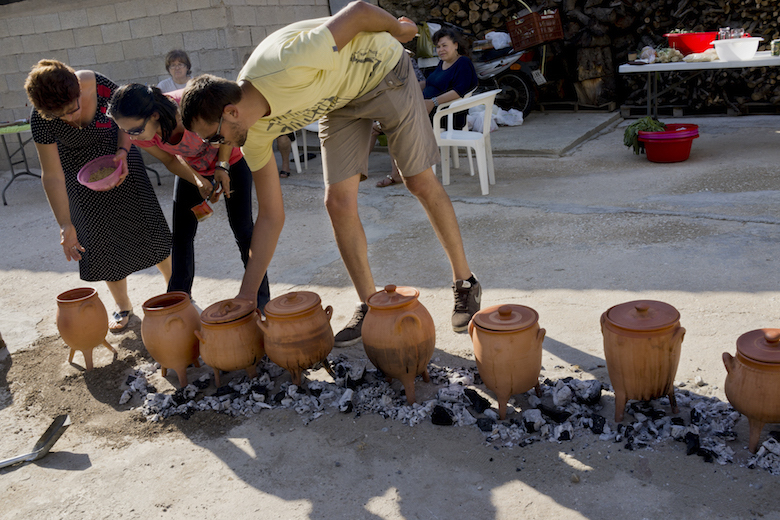 These vessels contain many stories—stories of the creators of this cooking technique and the suppliers of the ingredients. Stories about the cooks, hunters, gatherers, fishers, beekeepers, and tradespeople that traveled far to bring precious goods and insight to their communities. Stories about the people that enjoyed these feasts, the revered writers that described these experiences, and the archaeologists that devote their lives to discovering them. 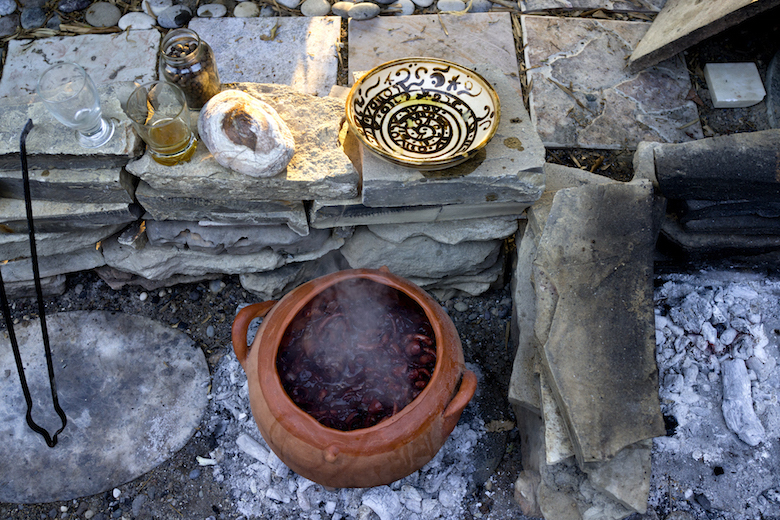 Connecting with our past provides invaluable insight into our future—a seemingly simple ancient cooking vessel is an important messenger. That day Oino thought she would cook the seafood that had been caught by Velchis, her son, at the beach. She lit the fire and put in the clay pots the catch of crabs, snails and the head of a big fish. She also added oil from the olives she had ground on the stone wheel. While the food was boiling over the fire, suddenly the earth began to tremble, the house on the beach of Crete was shaken and began to collapse. Oino ran for safety and did not return. The pot of food remained beneath the ruins until the day the archaeologists found it about 3,500 years later. Greek, from, lives and works in Lassithi, Crete. Archeologically-correct Minoan urns likely cooking the lentils that Jerolyn Morrison and Minoan Tastes has resurrected and preserved from ancient times. Though this is a modern photo, I can't help but think of ancient women communing with women today about the age-old celebrations and traditions. Women have long been keepers of the hearth and original cultures around the world better understand the value of health and home as central to our societies. By honoring these traditions, we honor these women and all they have contributed. -- Gloria Steinem, writer, activist, organizer. American, traveled to Crete for 80th birthday celebration. Complicated...Jerolyn and Matina prepare a meal full of Cretan nature with the essence of Minoan memories, at least in our imaginations. Behind them there are our colleagues (archaeologists) and friends whose we love to meet every summer. But in this image there is also the magic of common eating and drinking, which always played (and plays) an important role in human society. Czech Republic, raises Czech-Cretan family in Brno and on the island of Crete. A magical, mysterious, once-in-a-lifetime culinary experience was graciously served to my family in these pots. This culinary and educational adventure gathered us around a glowing campfire. It was amazing. 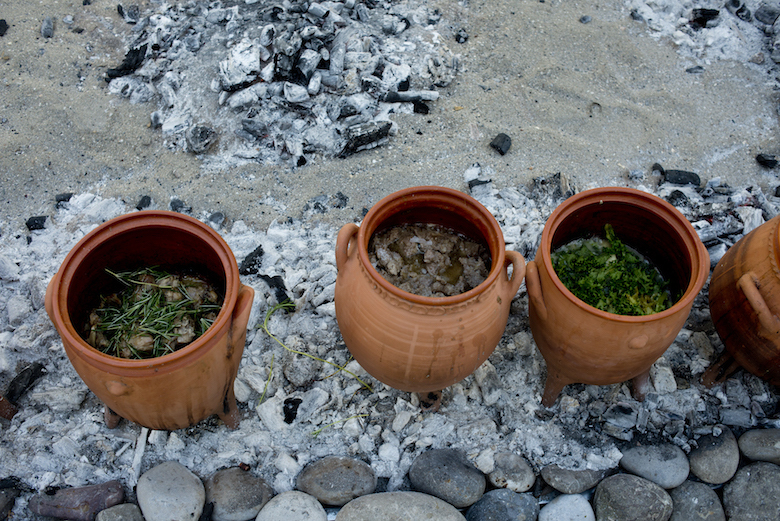 A bountiful Minoan-inspired dinner simmered in replicas of ancient cooking pots. Sipping wine from the handmade cups given as gifts allowed us to take our adventure home. This evening of ancient and modern Greek hospitality, history, food, wine, and the Cretan culture remains among my most treasured memories of 23 years of State Department life overseas. American, lived in Greece and visited Crete with family.